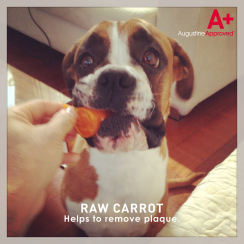 Welcome to your free guide to healthy eating for our 4-legged friends with huge thanks to my mate Phivo Christodoulou at Augustine Approved. Before we dive into the 6 tips, here is a great, bonus tip I got from Rodney Habib, founder of Planet Paws and a big advocate of healthy food choices for dogs. When buying dog food from a store, check the list of ingredients and see which ones come before and after “Salt”. Anything that comes afterwards is in such tiny doses as to be negligible, so don’t be fooled by the picture on the front that may lead you to believe that there is a plentiful supply of a particular supplement or foodstuff. A generally balanced diet is usually the best bet unless there is a medical problem, although the natural tendency to make the most of any opportunity is still alive and well in some dogs. Phivo would tell you that his aim is to inspire people to produce their own dog’s meals. However, if you are happy with the current food you are feeding then incorporating even some of these principles will benefit your dog. Remember, it doesn’t have to be an all or nothing mentality – do what you can, when you can. Fresh wholefoods such as vegetables and fruits are full of live enzymes and will add new dimension to your dog’s health. Wholefoods are full of fibre that aids digestion and improves the journey through your dog’s system. Due to the cooking processes that shelf stable foods are subject to in order to gain a long shelf life, many of the nutrients are destroyed. For this reason synthetic nutrients are added back into the products. These nutrients are synthetic imitations of those found in nature and therein lies a vast difference. Unlike most synthetic nutrients, wholefoods have the important nutritional co-factors present that assist the body to absorb and assimilate nutrients. You are not just what you eat, but more importantly you are what you can absorb. Do your own research on safe wholefoods for dogs and also look at the preferred ingredients list on the AA website. You will be amazed at which parts of the vegetables are the most nutritious. For example, broccoli stems contain more nutrients than the head. Puree vegetables for maximum nutrient absorption or feed whole as a bone replacement for teeth and gum maintenance. Inflammation is a major part of disease so it is important to research every ingredient and process that makes up your dog’s diet. Inflammation is the banner under which the leading causes of premature aging fall. As you are probably now aware, processed commercial foods are inherently inflammatory so at the very least offset their ill effects by adding anti-inflammatory wholefoods into the mix. Wholefoods high in antioxidants also help reduce inflammation in the body. Pancreatitis and arthritis are common when processed food is fed too often. Keep your dog young and healthy by feeding wholefoods that are high in antioxidants and anti-inflammatories. We are the only species on the planet that cooks our food by choice and we destroy most of the beneficial nutrients in our dog’s food through cooking. Whilst some wholefoods release more nutrients once cooked, cooking meat should be avoided when possible. Irrespective of nutritional values, here is why commercial pet foods are fundamentally flawed. "When the muscles of mammals, fish, or birds are cooked at high temperatures carcinogenic chemicals called heterocyclic amines are created that may increase the risk of breast, colon, lung, pancreatic, and prostate cancer. 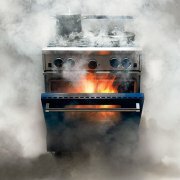 Risky cooking methods don’t just include barbecuing, frying, and grilling. Even just baking chicken at around 350ºF for 15 minutes leads to significant production of these cancer-causing compounds." Unlike animal fats and other vegetable fats, virgin cold-pressed coconut oil is truly unique. Whilst it high in saturated fat, it is a healthy saturated fat that is predominantly made up of medium chain fatty acids that the body does not store. Virgin cold-pressed coconut oil goes straight to the liver and gets converted into energy. The more energy your dog has, the more it exercises, the more it exercises, the leaner it stays, the leaner it stays, the less chance of obesity related diseases. 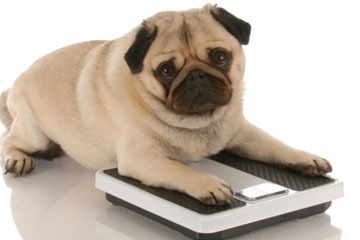 Feed your dog according to whether they need to gain or lose weight. For example, if your dog is overweight then feed towards the earlier part of the day when they get a chance to work it off. If your dog needs to gain weight then feed more regularly and especially before bed time, not allowing the dog to burn it off. Within reason, do not worry about your dog being too skinny. It’s OK for a dog to be very slim especially in their younger more active years. As they get older it is a lot easier for them to gain weight so do not set them up for failure by trying to make them heavier too early – it will come naturally. Leaner dogs are healthier dogs. Some commercial treats claim to be beneficial to teeth and gum health but their unhealthy ingredients and cooking processes can cause other health problems. If you ask any dentist what the best way to keep teeth plaque free and gums healthy, they will recommend brushing. Second to that - apart from salt rinses that are abrasive - is to chew on wholefoods like carrots and zucchini. You see, it’s all about the rubbing action. The same logic applies for dogs, however it isn’t always possible or practical to brush their teeth. A good alternative is making fresh treats that dogs can grind on themselves to help remove plaque. Try cutting some holes in vegetables and cover them in virgin cold-pressed coconut oil when it is in liquid form. Put in freezer for five minutes and serve. Coconut oil acts as a great canine toothpaste because it has antiviral, antibacterial, and antifungal properties and most dogs love the taste. These treats can also satisfy a dog’s need to grind and they are not as harsh on teeth as bones. 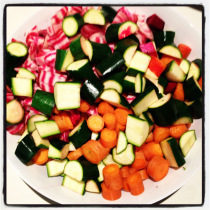 Be warned, there will be bits of vegetables everywhere but that’s ok – we aren’t feeding these for digestion. N.B. On the rare occasion that a dog does not like the treats, do not give up – play a game of roughing them up with the treats and throwing them to encourage a fetching game, or even play hide and seek. 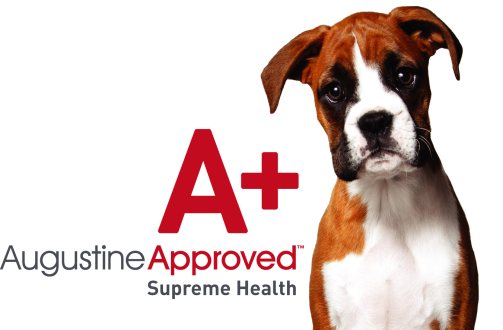 Making sure that our dogs are as healthy as possible is easier than you think. Often, tiny changes in what you feed them can have dramatic results. For example, adding sardines are a great source of protein, vitamins and minerals BUT make sure that you get the ones in spring water rather than oil. The healthy benefits of Omega-3 that fish contains are actually weakened by the oil that contains Omega-6 (thanks again Rodney). OK, there are actually eight tips in this guide, but it doesn’t hurt to have more knowledge… The advice given is a good guide to avoid potential problems in the future, but diet is only half of the equation. Exercise makes up the rest, but just like with diets, there is a difference between good and bad exercise too. For example, instead of walking for hours on end in the belief that this is good for the dog’s health and behaviour, changing what you do every day and being intelligent with exercise actually calms a dog down and prolongs a healthy life. This is particularly true for dogs as they get older and their joints deteriorate (even with the positive impact that diet change can give). Similarly, some breeds of dogs can have issues with exercise which means that it makes sense to work smarter, not harder. My eBook “Think Like a Dog” contains valuable, common-sense advice on the right way to exercise your dog while avoiding the common trap that most people fall into. You can get your copy at my website www.tonyknightdoglistener.com/pages/think-like-a-dog-ebook.